A drowned Syrian toddler washed up on a Turkish beach. Seventy-one migrants suffocated to death in a truck outside of Vienna. A razor wire fence strung the full length of Hungary’s border with Serbia. These are the tragic icons of Europe’s refugee crisis, images that finally shattered the world’s indifference, moving it to tears, and, hopefully, to action. And German soccer’s generosity doesn’t stop at slogans. The Darmstadt 98 club is raising funds to help refugees find work. Schalke 04 collects clothes, toys, and soccer gear for refugees at every home game. Berlin’s Babelsberg 03 club, an organization known for its political engagement, has formed a second division team composed entirely of refugees. All 18 teams in the Bundesliga—the German premier league–have made it a practice to bring refugees to games; many organize transportation. “Our club believes it is our responsibility to help these children, women, and men who are in such great need,” said Bayern Munich legend and current CEO Karl Heinz Rummenigge. The reigning Bundesliga champion has pledged 1 million Euros in a joint effort with Munich’s city and state governments to build a training camp where refugees can practice soccer, receive clothing, and study German. ESV Neuaubing Sports United: Bavaria’s first refugee soccer team. 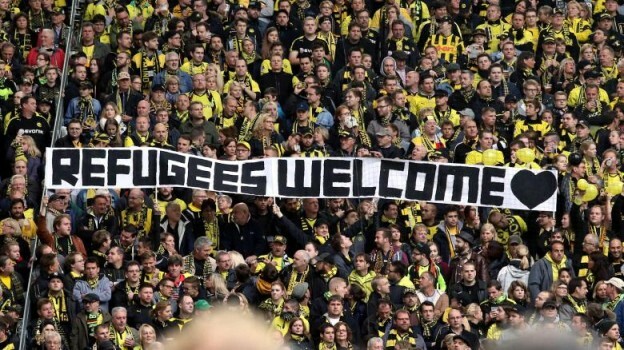 The outpouring of sympathy for refugees—and the sincere efforts to help them—are broad based across German soccer. They are also somewhat surprising. For decades, Germany’s ultra fans used Bundesliga stadiums as venues to spew their hatred of blacks, Jews, homosexuals, and all things foreign, and transformed the surrounding areas into battlegrounds. Germany’s radical fan fringe maintained strong ties with right wing extremist groups, ties many club owners chose to ignore. Last year, several rival ultra bands forged a sinister truce to form the xenophobic HoGeSa (Hooligans Against Salafists.) HoGeSa has already staged rallies and marches in key German cities to protest the “islamization” of their country. 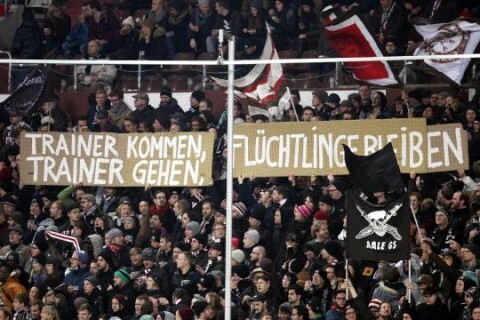 German soccer, and even Germany, cannot solve the refugee crisis alone. Europe—and the West—will need a decisive and well-coordinated policy to accommodate and integrate a wave of asylum seekers that may number up to one million by year’s end. Yet while their leaders wring their hands and their fellow Europeans close their eyes—and minds—these clubs and fans have made a statement, and taken action. They deserve applause. This entry was posted in Ken's Blog on September 17, 2015 by Ken Shulman. I’m happy if you use material from the away games site so long as the material is properly identified and cited. Please mention the author and away games. Tell me more about your site.